The documents below contain detailed descriptions of the science case for a European ELT. The fact that several such documents exist reflects to some extent the evolution of the E-ELT concept from a 50-100m telescope to a 30-60m telescope, which required some revision of the original science case. An Expanded View of the Universe, a high-level document outlining the E-ELT's science case. Edited by the E-ELT Project Scientist, Markus Kissler-Patig, and M. Lyubenova (Dec 2009, updated in 2011). 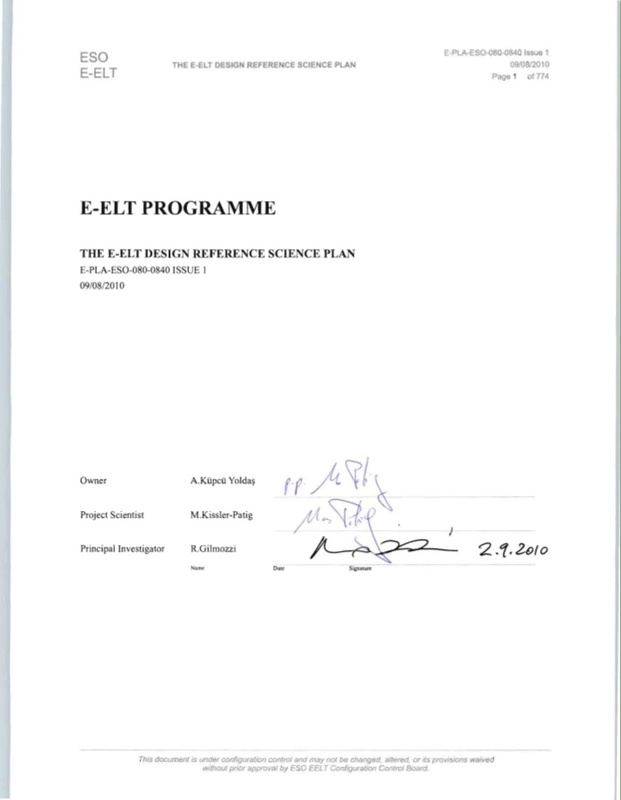 The final reports of the E-ELT Design Reference Mission (Oct 2010) and the E-ELT Design Reference Science Plan (Sep 2010). 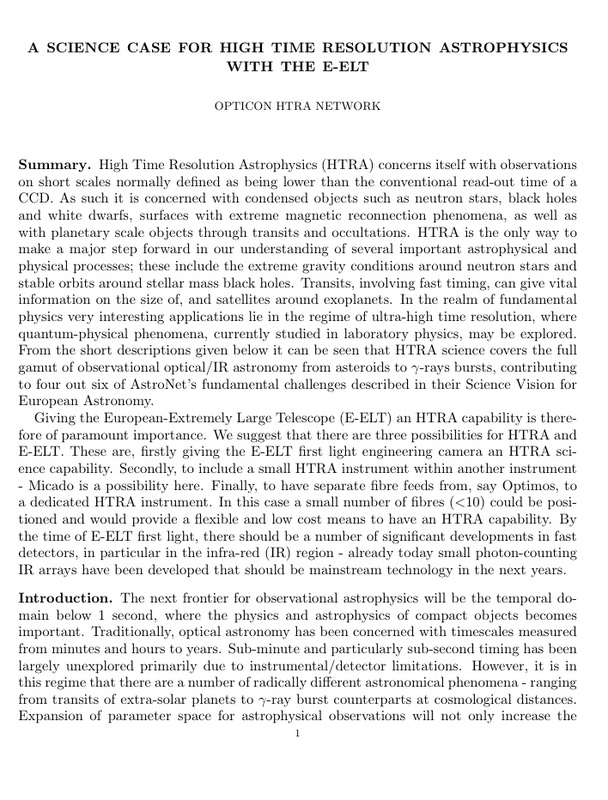 The Science Case for the High Time Resolution Astrophysics with the E-ELT, a white paper from the Opticon HTRA network (May 2010). 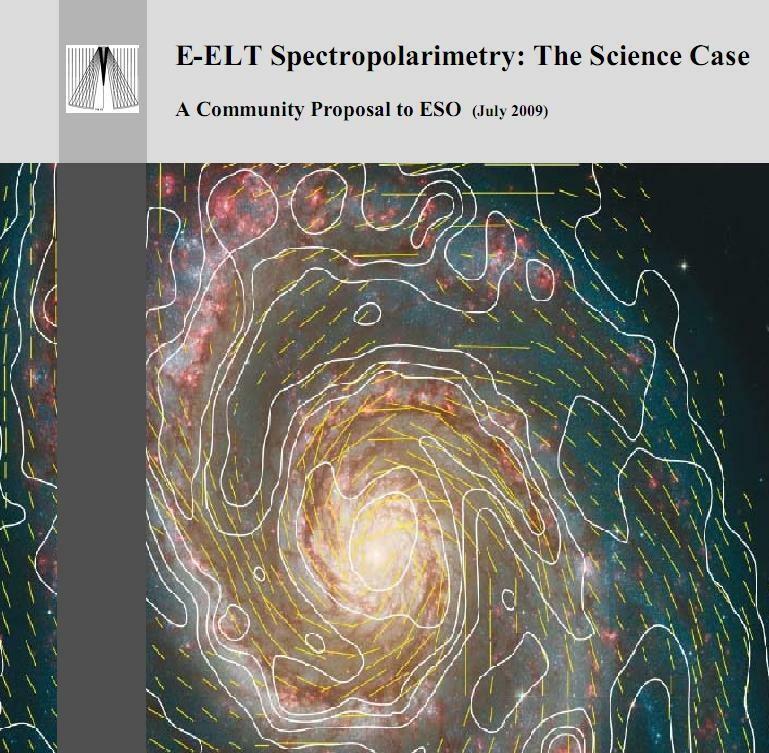 The Science Case for Spectropolarimetry at the E-ELT, a community proposal submitted to ESO in July 2009. Report by the E-ELT Science Working Group from April 2006. It presents the case for a 30-60m ELT. The OPTICON Science Case for a 50-100m ELT. Developed through a series of community meetings sponsored by OPTICON and co-ordinated I. Hook and G. Gilmore. When referring to this document please cite: Hook, I. M. (ed. ), 2005, "The Science Case for the European Extremely Large Telescope: The next step in mankind's quest for the Universe". Please note the revised list of section authors. Top-level brochure summarising the science case highlights from the above book. Also available in a double page format. The OWL Blue Book contains a section on the science case for OWL. The Euro50 White Book contains a section on the science case for a 50m telescope. See also this list for the science cases of other ELTs.